The United States remains the world&apos;s high-tech leader, but other nations are catching up, the National Science Board warned in two recent reports. Science and engineering research is becoming a global enterprise, as more nations develop research capabilities and international collaborations grow in importance, the board said. U.S. corporations are contributing to the shift by conducting an increasing amount of their research and development abroad. The board — which advises the president and Congress on science matters — urged the federal government to take several steps to enhance U.S. success in the increasingly competitive international marketplace for high-tech goods and services. "Our nation&apos;s future prosperity and security depend on strong and unwavering federal commitment to this goal," the board said in a recent report titled "Globalization of Science and Engineering Research." • The National Science Foundation review its criteria for making grants to ensure that it finances "truly transformative research." • All federal agencies assess their support of research in light of what other countries are achieving. • The President&apos;s Council on Innovation and Competitiveness takes steps to ensure the U.S. economy benefits from research and development that American companies conduct overseas, and to identify areas in which the United States should strive to be the global R&D leader. The NSF criteria were revised about a decade ago, said Louis Lanzerotti, chairman of the National Science Board committee that issued the report. "It&apos;s really important to re-evaluate whether these criteria are sufficient in this more globalized climate," he explained. Similarly, he said, all federal agencies must assess their research needs "much more globally than has been done in the past." The recommendations are not "anti-internationalist," Lanzerotti said. But it is reasonable to want Americans to benefit from American companies&apos; research, he said, and to make sure that U.S. scientists can do research that&apos;s critical to the national interest. 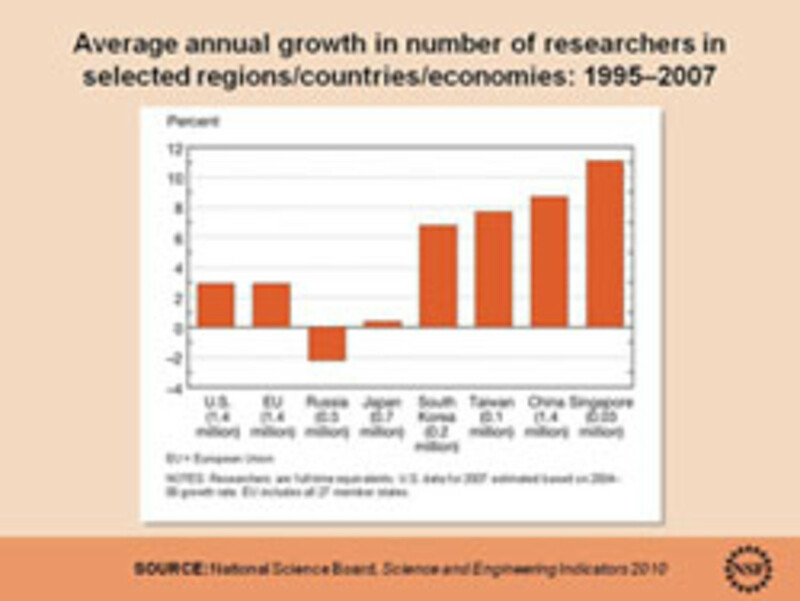 Average annual growth in number of researchers in selected regions. Click to enlarge. The cause for concern and need for action are shown in a large number of international trends, the board said in the recently released report and in the 2010 edition of its biannual Science and Engineering Indicators, which was published in mid-January. By many measures of scientific and technological achievement, U.S. leadership is eroding as other nations, especially in Asia, rise. The data tell "a worrisome story," according to Kei Koizumi, assistant director for federal research and development in the U.S. Office of Science and Technology Policy. The U.S. share of global high-tech exports dropped to 14 percent from 21 percent between 1995 and 2008. China became the world&apos;s leading high-tech exporter by more than tripling its share to 20 percent. U.S. R&D expenditures grew 5 to 6 percent a year from 1996 to 2007, while China&apos;s soared 20 percent annually and in India, South Korea and Taiwan expenditures rose 9 to 10 percent. The fastest rise in completion of graduate level science and engineering degrees is occurring in China, India, South Korea, the Philippines and Thailand. Since 2006, foreign students have earned more than half the science and engineering doctorates awarded by U.S. universities, including two-thirds of engineering doctorates. Researchers in selected regions. Click to enlarge. Most of these developments don&apos;t portray a United States in decline as much as they show the rest of the world on the upswing. Around the globe, "there is widespread recognition of the need to move to a knowledge-intensive economy," the National Science Board reported. "Governments increasingly acknowledge the role of (science and technology) in generating new jobs (and) economic prosperity." Even governments in developing countries "have come to view science and technology as integral to economic growth and development, and they have set out to build more knowledge-intensive economies." Those governments are investing in research, education and scientific facilities, and providing subsidies and tax incentives that encourage private companies to carry out research and development that benefits their nation. Despite negative trends, U.S. R&D continues to lead the world by a large margin. 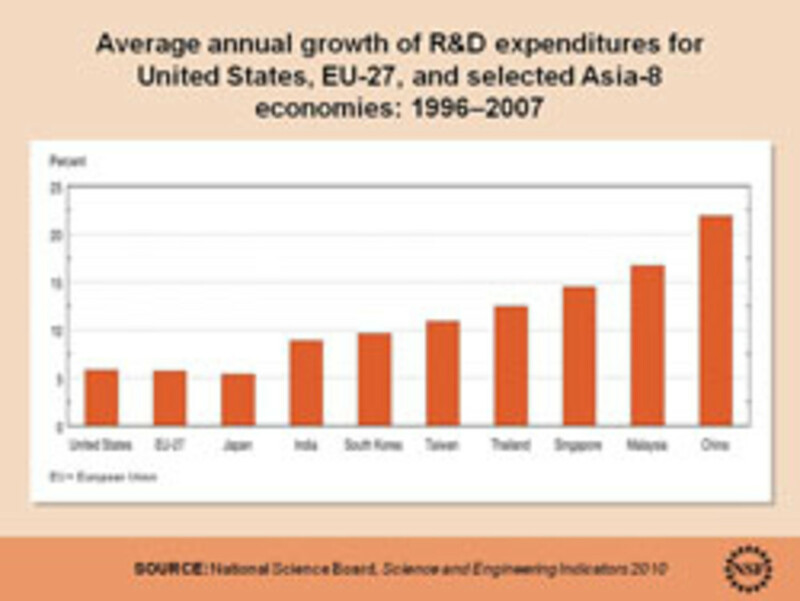 In 2007, America&apos;s $369 billion R&D spending exceeded all of Asia&apos;s $338 billion and all of the European Union&apos;s $263 billion. The United States spent more than the next four countries — Japan, China, Germany and France — combined. America&apos;s share of all high-tech manufacturing has risen — and it continues to lead the world — even though the U.S. share of exports has declined. That&apos;s because the United States consumes so much of its product domestically. The United States makes nearly a third of the world&apos;s high-tech goods, compared with the European Union&apos;s 25 percent and China&apos;s 14 percent. It&apos;s the world leader in communications, semiconductors, pharmaceuticals and aerospace. It trails only the EU in scientific instruments and China in computers. U.S. inventors obtained 81,000 U.S. patents in 2008, more than double Japan&apos;s 35,000 and all of Europe&apos;s 23,000. America&apos;s 49 percent share of those patents dropped from 55 percent in 1995. 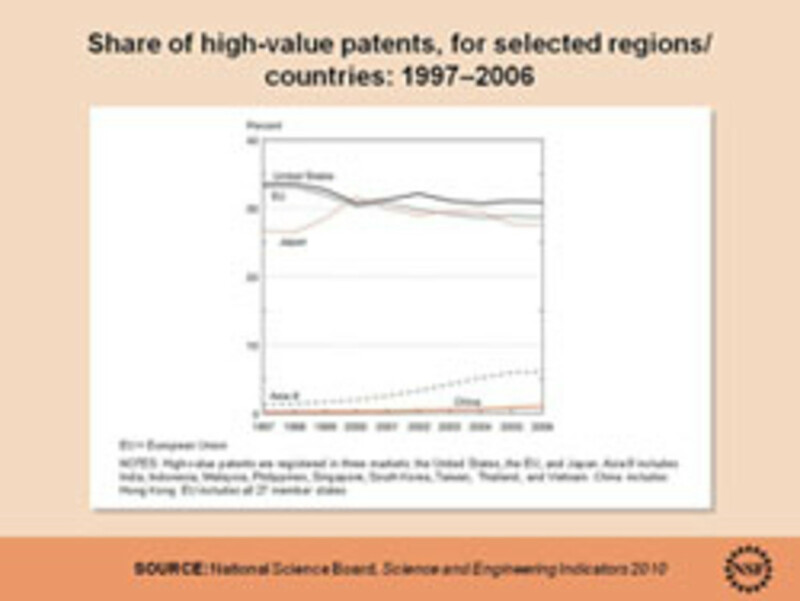 Share of high-value patents in selected regions. Click to enlarge. U.S. inventors also led in what the report calls "high-value" patents — those that were given protection by the EU and Japan as well as by the United States. The U.S. share of 30 percent was down from 34 percent in 1997. China obtained just about 1 percent of both kinds of patents. But its scientists have become the second-most-prolific contributors to scholarly journals, another area in which the United States continues to lead the world. 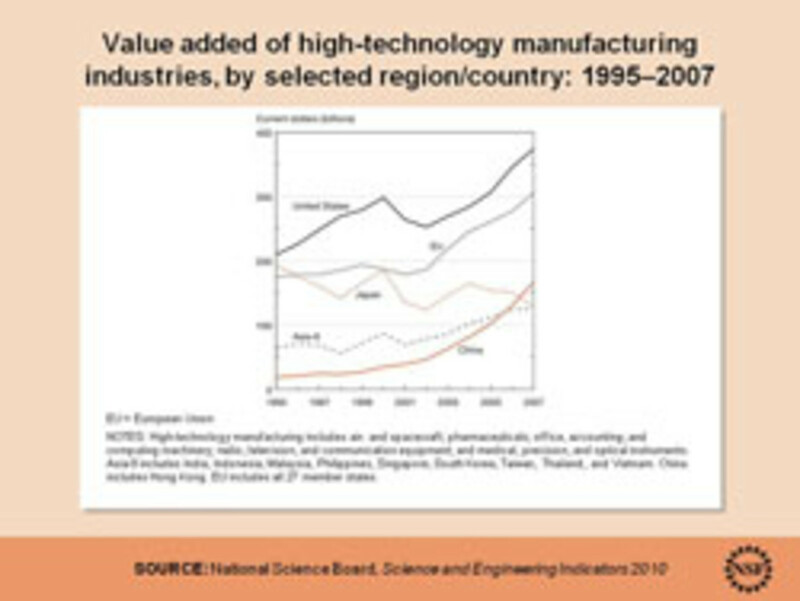 Value added of high-tech manufacturing industries by region/country. Click to enlarge. The globalization of science is illustrated by the worldwide growth in many measures of scientific prowess, no matter which countries dominate, the board said. For example, high-tech exports more than tripled to $2.3 trillion worldwide between 1995 and 2008. 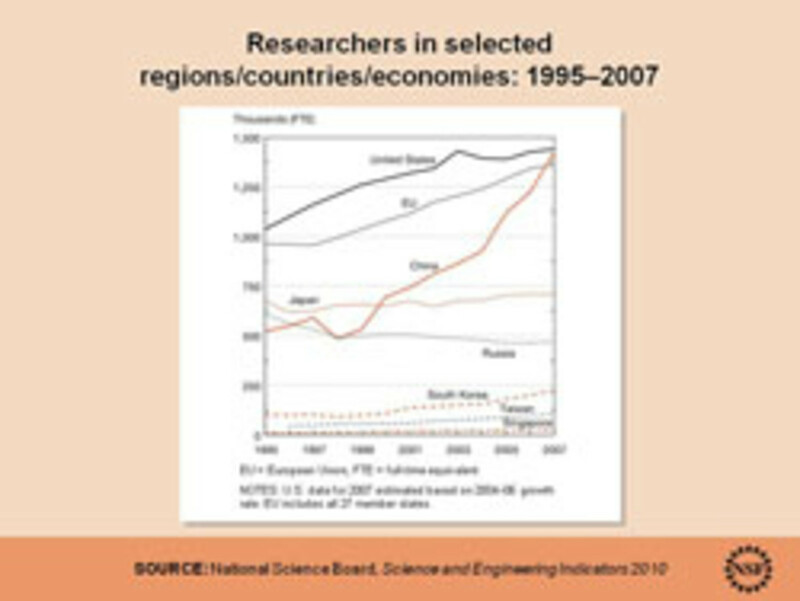 The estimated number of researchers increased to 5.7 million in 2007 from 4 million in 1995. Global R&D expenditures totaled $1.1 trillion in 2007, up from $525 billion in 1996. Cross-boarder co-authorship also increased from 8 percent of scientific articles published in 1988 to 22 percent in 2007. Foreign corporations actually invested more in U.S.-based research ($34 billion) in 2006 than U.S. firms invested overseas $28.5 billion. Both more than doubled since 1995. The growth of science abroad is not necessarily bad for the United States, said Alan Leshner, chief executive officer of the American Association for the Advancement of Science. "I am very happy about the spread of science around the world," Leshner said. "If science can benefit the economies of other countries — particularly developing countries — that&apos;s all well and good. The United States benefits because the more scientific enterprises that are going on, the more scientific advances occur, and that&apos;s good for everyone." To engineers, every problem is just a solution that hasn't occurred yet, our Michael Haederle learns at the El Paso innovation conference.